The Air Force V has been developed to deliver another dimension of analog sound to more analog enthusiasts at a more affordable price. This model has a similar sized compact chassis as the Air Force III, and by designing an elaborate drive system successfully reduces any motor vibrations. 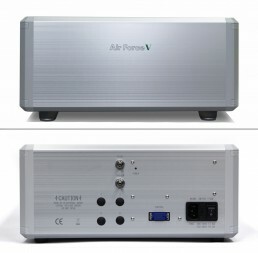 The Air Force V consists of two units: the Main Unit (including built in motor) and the Pump / Power Supply / Air Condenser Unit.The Air Force turntables feature unique and refined “air” technologies which include our air bearing that allows the player to flow on a very thin layer of air. This mechanically isolates the rotating platter and the record from any vibration. 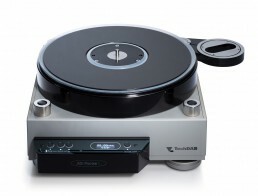 Additionally our vacuum hold-down system clamps an LP onto the platter itself. With these technologies the Air Force turntables have distinguished themselves from conventional turntables in terms of sound and performance. While most turntables on the market deliver a similar sound from that of the old analog age, in our opinion, analog sound should not remain static, much the same as we have witnessed decades of advancements in the digital audio sector. We at TechDAS believe that the analog sound we produce has gone beyond previous levels of signal to noise ratios and is more inline with the signal to noise ratios achieved in modern digital audio. And TechDAS “Air Force” technologies bring about the ultimate state-of-the-art analog sound. Platter (main and sub platters): Precision machined aluminum (A5056). Black anodized and high gloss polished.